The Robt. H. Gibson River Garden at 157 Main St. in Brattleboro is the place to be on Friday, September 2, from 5:30 to 8:30 p.m. during Gallery Walk. Come celebrate the installation of "The Power of Water/The Power of Words" Art Project. The Connecticut River Watershed Council (CRWC) is gathering personal stories about New England's longest river. What do our rivers mean to you, your family, your community? What are your hopes and dreams for the future of our rivers? This is your chance to get involved. As owners of our rivers, citizens have a say in how hydroelectric facilities will be operated, how negative impacts on the river can be mitigated, and how renewable energy can be made more sustainable. In the fall of 2012, the Federal Energy Regulatory Commission began the relicensing process for five hydroelectric facilities in northern Massachusetts and southern Vermont that produce over 30% of hydropower generation in New England and affect more than 175 miles of the Connecticut River from north of Hanover, New Hampshire, to the Pioneer Valley of Massachusetts. The relicensing includes dams at Wilder, Bellows Falls, and Vernon in Vermont, as well as Turners Falls Dam and the Northfield Mountain Pump Storage Project in northern Massachusetts. With each license lasting 30 to 40 years, decisions made in 2018 will have an impact over a generation. "The Power of Water/The Power of Words," a monumental, community-created art installation, provides input to the State and Federal governments as they make decisions about how these dams will operate over the next three to four decades. 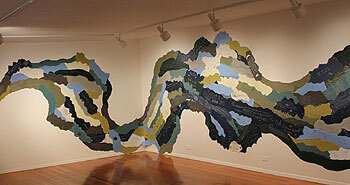 The "River of Words" is made of torn pieces of cover-weight paper on which participants write their aspirations, thoughts, and feelings about their river. The individual pieces of paper with participants' river stories are then used to build a site-specific art installation of a river. Individual voices will join hundreds of others of all ages to have a direct influence on state and federal decision-makers. The CRWC is also hosting a Closing Reception event on Thursday, September 29, from 5:30 to 7:30 p.m. featuring a brief talk on the project with live music and refreshments for attendees. It's not too late to add your story. The CRWC can bring this FREE program to your organization or group and provide an engaging presentation that can be made to groups ranging in size from a dozen to over 100. The event works well for a wide range of ages and interests and lasts approximately one-and-half hours. You'll learn all about the relicensing and have a chance to submit your piece of art. This project provides an exciting opportunity to engage civically and creatively in a policy-making process that builds community, nurtures our sense of ownership, and provides an outlet for our voices to be heard. For more information, please call Colleen Bent at (413) 772-2020 ext. 206 or email her at cbent@ctriver.org. "The Power of Water/The Power of Words" is supported by a generous grant from the Putnam Foundation. CRWC is proud to partner with Christine Destrempes and Art for Dialogue on this project.